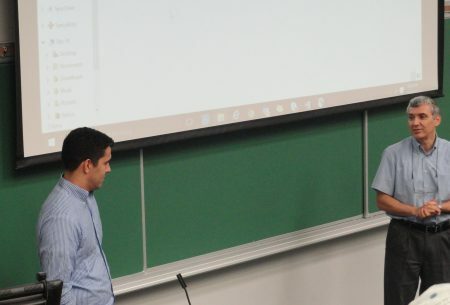 Dell EMC Enterprise Account Manager & 2016 UF Department of Industrial & Systems Engineering Alumni, Ryan Strobel paid a visit to his old “stomping-grounds” on November 8th and 9th to give some insight on life after undergraduate studies. His first day on campus included visiting UF ISE Undergraduate Coordinator and Professor, Dr. Serdar Kirli’s VB.net class. Strobel paid homage to working for his dad, in their family business (Sunshine Solar Services) since the age of 12. While there, he worked as a Solar Installer, Intern Manager, and Sales Representative and also created an application called Solar Estimator, so that the business could run more efficiently and effectively. He also mentioned by speaking up and “getting back to the basics” of job hunting by calling people allowed him to obtain his position. 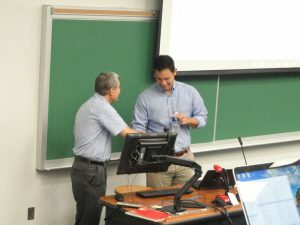 Dr. Serdar Kirli and Ryan Strobel shake hands after Strobel’s seminar in Kirli’s VB.net class. Strobel definitely honed his leadership skills in Dr. Kirli’s Decision Support Systems course and even volunteered himself as a source for possible internships and employment with Dell EMC. Aside from employment and internships, Strobel encouraged students to try studying abroad, so that they could experience how systems work in other countries. During his final seminar, in the Sales Engineering course, he eased the worries of the students by breaking down the daily duties of a sales professional and the three tiers that sales professionals have to go through at Dell EMC. Along with the presentation, Strobel assigned the students to five groups of five, and presented them with brainstorming questions. This allowed the students to experience how sales professionals think and work together. 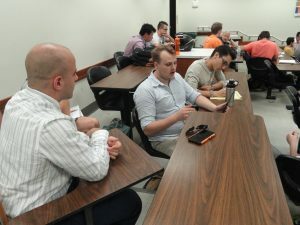 Sales Engineering students brainstorm answers to Ryan Strobel’s questions. At the end of his stay, Strobel reflected on his time as a student and now being on the opposite side, as a professional.